The next to youngest child of Sam and Margaret Houston drove everyone nuts with his shenanigans. One might say that Andrew Jackson Houston was a brat. After his father was elected governor of Texas and the family moved to Austin, young Andy regarded the state capitol as his own special playhouse. Among the most infamous of Andy’s antics was the Senate lock-in. He locked the doors of a room where state senators were meeting and wouldn’t let them out. They yelled out the windows for help until finally freed. Gov. Houston rounded up the usual suspects (actually, just one suspect) and gained a tearful confession from Andy, plus the key to the meeting room. The governor’s mansion had a population explosion of fleas, thanks to Andy the dog-lover. He was always bringing stray dogs home and the dogs came attached with fleas. The staircase in the mansion gave Andy something to do. He zoomed down the banister, landing abruptly in front of anyone nearby. It was reported that several people, distinguished guests included, were knocked to the floor by The Slider. A typical little brother, Andy enjoyed making his sisters miserable. One such activity involved crawling under at table and pinning together the skirts of one his sisters and her playmate. Soon thereafter, the family took up full-time residency at Cedar Point, their summer home near present-day Baytown. Although the modest home was a far cry from the governor’s mansion, Cedar Point provided Houston with a sense of peace and a source of income. The hero of San Jacinto cut and sold timber from his land to support his family. And the move turned out to be good for Andy, who found an outlet for all that pent-up energy. Around Cedar Bayou he enjoyed the wide, open spaces, riding horses, going fishing and – for the most part – staying out of trouble. Eventually the family had to move to Huntsville because, as a result of the Yankee blockade at Galveston, Houston no longer could ship his timber to various ports. Andy was only 9 when his father died, and there are no further accounts of his “bratty” behavior. Apparently, the problem child matured and became more responsible. His aspired for a military career but ill health forced him to drop out of West Point. He continued to have a strong interest in military life, though, and helped Teddy Roosevelt round up recruits for the Rough Riders at San Antonio. After serving as a U.S. marshal, Andy joined the faculty at St. Mary’s University in La Porte, where he taught military science and led its cadet corps. St. Mary’s, in addition to the seminary, then provided a standard university program. With his two daughters, Andy lived in the La Porte-Morgan’s Point area and spent countless hours at St. Mary’s, teaching and visiting with friends. One of his friends was seminary student J.P. O’Sullivan, a future pastor of St. Joseph’s Catholic Church in Baytown. A convert to the Catholic faith, Houston became an expert on the history of the church. He was an expert on Texas history as well, and worked diligently to preserve the memory of his father. Andy Houston was responsible for the state historical marker placed at the Cedar Point site in 1936 and he played an active role in plans for construction of the San Jacinto Monument. 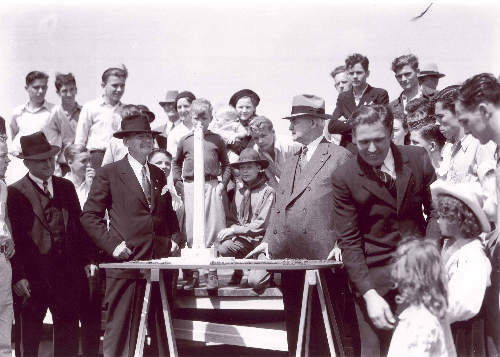 Sam Houston's only surviving son, Andrew Jackson Houston, and Houston businessman and current chairman of the Reconstruction Finance Corporation, Jesse H. Jones, and a crowd of attendees, admire the model of the San Jacinto Monument unveiled at the monument's groundbreaking ceremony, March 27, 1936. Photograph courtesy of the Briscoe Center for American History, UT-Austin, Bailey (Bob) Studios Photographic Archive, e_bb_0774. Appointed to the U.S. Senate in 1941, he died soon after taking office. The last surviving son of Sam Houston was buried in the state cemetery in Austin, the city he once terrorized as a “hyperactive’ child. Although Andrew Jackson Houston could never match his legendary father’s place in history, his development into a scholar and a gentleman could teach a lesson to all frustrated parents. Never give up – there’s hope for brats.